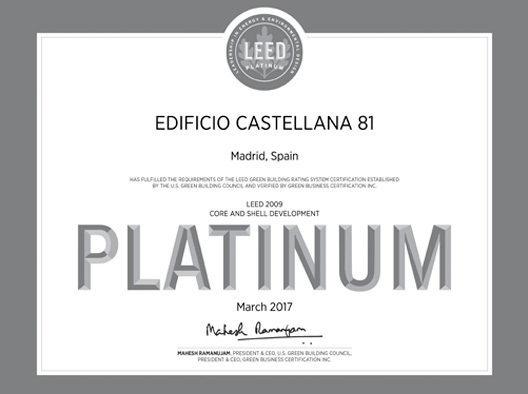 Castellana 81 holds Platinum LEED certification for Core & Shell, making it the first and only office building in the Paseo de Castellana to be awarded the highest attainable level in sustainability in the LEED certification system from the US Green Building Council (USGBC). This distinction guarantees Castellana 81 as an absolutely cutting edge, sustainable building with the highest standards of well-being and comfort for its tenants. LEED is the sustainability certification system with the most significant international presence. Its objective is to promote buildings that are respectful towards the environment, economically viable, and comfortable for living and working. 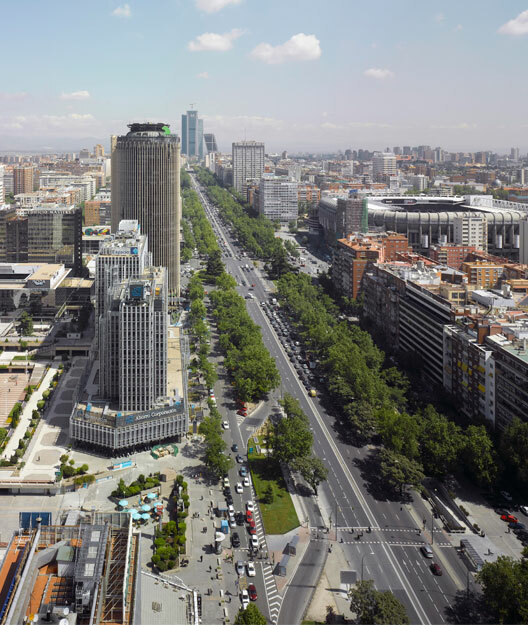 SUSTAINABLE LOCATION: Castellana 81 has obtained the highest rating on availability of close public transport links (metro, train and bus), as well as for promoting cycling and efficient or shared vehicle use by designating spaces in the car park for these alternative modes of transport. EFFICENT WATER CONSUMPTION: the building obtains a reduction of 42% in sanitary water and running water consumption relative to a comparable property. Additionally, landscaping with native plant species which do not require irrigation is planned. ENERGY EFFICIENCY: Castellana 81 consumes 13.5% less energy per year than a conventional building of comparable use and size. The lighting system consumes 50% less. 30 photovoltaic panels have been installed on the roof to generate electricity, as well as a sanitary hot water production system via 24 thermal solar panels. In addition, Castellana 81 offsets the emissions from its electricity consumption with certified Green tags proving that 35% of the energy consumed by the building will be offset in 2 years by investment in Green tags at renewable energy plants. OPTIMAL AIR QUALITY: Guaranteed by using finished materials with a very low level of volatile organic compounds, as well as highly effective air filtering systems and CO2 room sensors. CORRECT LEVELS OF VENTILLATION AND COMFORT: the building will have the right levels of outdoor air in all areas of frequent activity, as well as the option of users controlling the HVAC system directly, ensuring comfort inside at all times. CONNECTIVITY BETWEEN BUILDING AND THE OUTSIDE: The transparency and number of views for occupants has been increased. 95% of workers have access to outside views. NATURAL LIGHTING: Castellana 81 offers optimal levels of natural light and glare control by using glass with solar control and shading systems. MATERIALS AND RESOURCES: Castellana 81 has a 55 m² waste management room and a high percentage of recycled (11.5%) and local materials (31%) have been used in the renovation of this room.